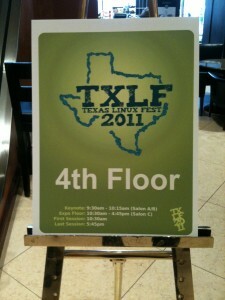 Last weekend, I had the opportunity to introduce Git and Gerrit to folks at the Texas LinuxFest 2011. From a quick poll in the members in the audience, there were about 60% of folks using Git, while only a few have used Gerrit before. From conversations I had with folks after the talk, there seems to be a lot of interesting in migrating to Git from their existing systems (which ranged from Perforce to SVN). Anyways, it was fun and I enjoyed the experience of being able to walk to a conference venue from my home office.